Add your message to the chocolates, not the box! Handmade personalised chocolates, deliciously done! Our chocolates are unique! 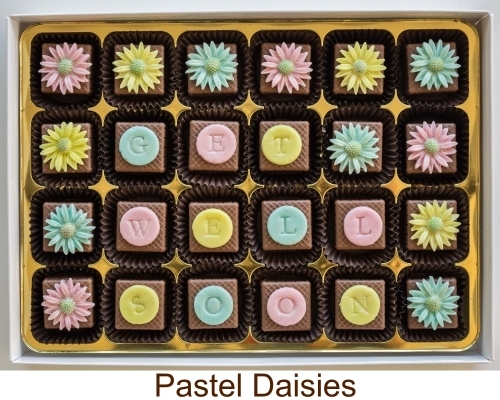 Beautifully decorated, deliciously filled with marzipan or fondant, with the option to add a personal message. We offer a range of handmade chocolate gift boxes, with each chocolate filled and decorated by hand, using unusual and delightful motifs. To create a very personal gift, we can add your message to the chocolates, not simply the wrapper, so the surprise is inside the box! Priced from £11.00 for 12 chocolates, up to £38.00 for an impressive box of 48. Why not delight a friend, loved one or special client with a unique gift to say "thank you" or "happy birthday" and make someone's Happy Chocolate Day! Personalised chocolates, deliciously done! Filled with marzipan and decorated with handmade marzipan motifs, with the option to add your message to the chocolates, not simply the packaging. Visit our website to browse the range and buy online. Our fondant chocolates have a silky smooth filling that maelts in the mouth! 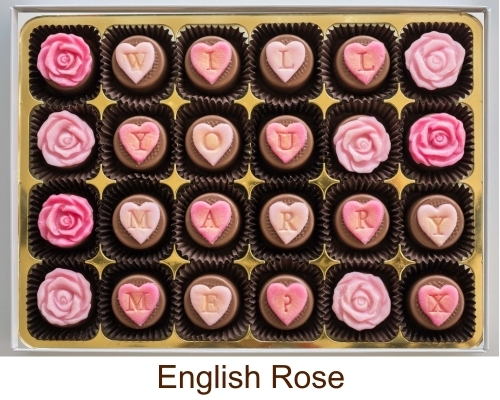 In a range of flavours including peppermint, rose, strawberry, lemon, you can add your own message to the chocolates, not simply the packaging. A very special chocolate gift.